Learn to use Amazon's Simple Queue Service to improve the performance of customer-facing services by offloading asynchronous tasks. This article illustrates how to integrate with Amazon's Simple Queue Service (SQS) using .NET Core and Lambda Functions. This article assumes basic familiarity with the Amazon Web Services (AWS) administration console. You will need to download and install the AWS SDK for .NET and configure it with your AWS credentials. Once you install the SDK, open Visual Studio and select the Create New Profile icon. 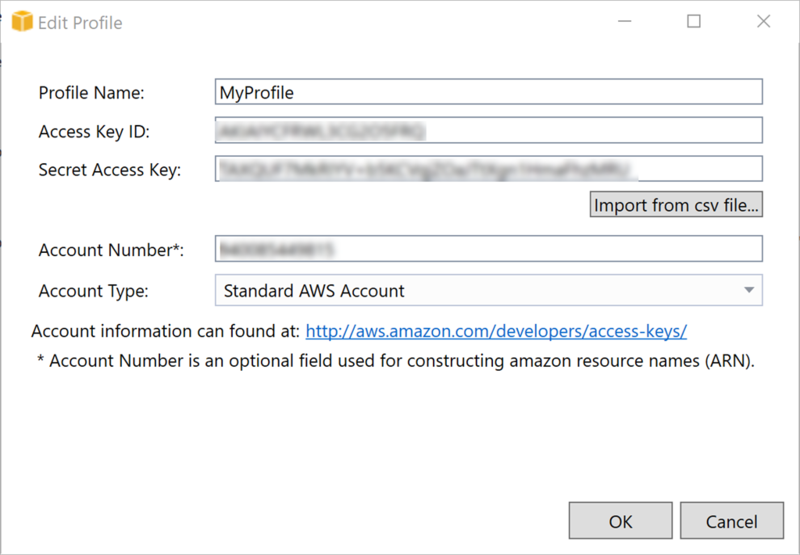 Enter your AWS Access Key ID and Secret Access Key. 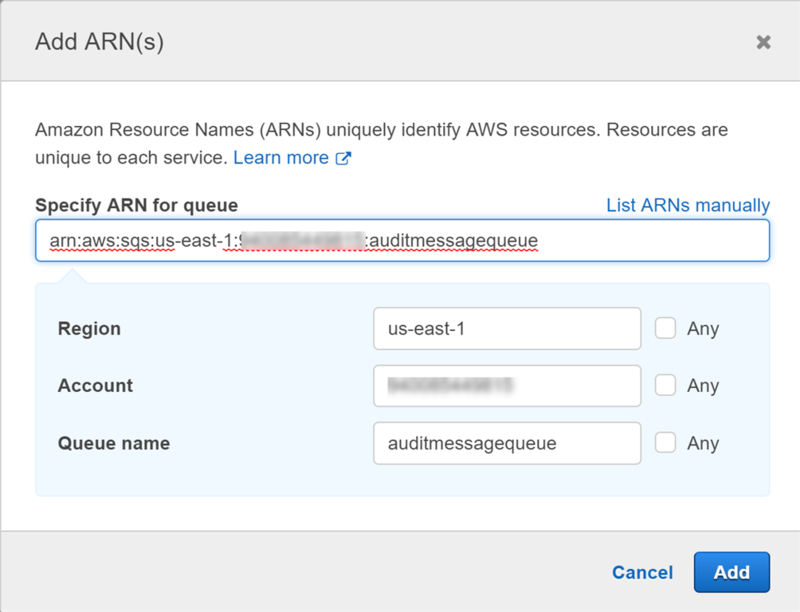 After creating an account at aws.amazon.com, log in and navigate to the SQS console and select "Create Queue". You're presented with a choice between a Standard Queue and a FIFO Queue. Standard Queue - Messages may not be delivered in the order they are added to the queue and there may be duplicates. Messages can be processed directly be a Lambda Function using a push approach. Provides higher throughput than FIFO queues. FIFO Queue - Messages are delivered in the order they are added and there are no duplicates. An EC2 instance or Docker container running a Windows Service or Linux daemon needs to pull messages from the queue. Standard queues require less infrastructure, but more application design consideration. An audit message should only be logged once even though a duplicate could be pushed to the Lambda. The queue message object includes a unique message id that can be used as a unique index in a DynamoDB table or a relational database table. Message order is also a challenge. Adding a date time property to the message and set it before sending it to the queue. This provides a column that can be used to present the messages in a report in the order they were created even if they were received out of sequence. The AuditMessage class attributes are decorated with attributes that bind it the AuditMessages DynamoDB table. While this uses DynamoDB, another implementation could use the EntityFramework to bind the class definition to a relational table. This unit test scaffolds the AuditMessages DynamoDB table to store the AuditMessage property values. Replace the AWS_REGION constant with the name of the AWS region in which you created your AWS account. This is the code of the Lambda function that processes messages from the SQS queue. The AWS_REGION environment attribute is provided by Amazon. It contains the name of the AWS region in which the Lambda is deployed. Note that it's used when creating the DynamoDBContext on line 45. The AuditMessage DynamoDBTable property saves having to provide another configuration entry. 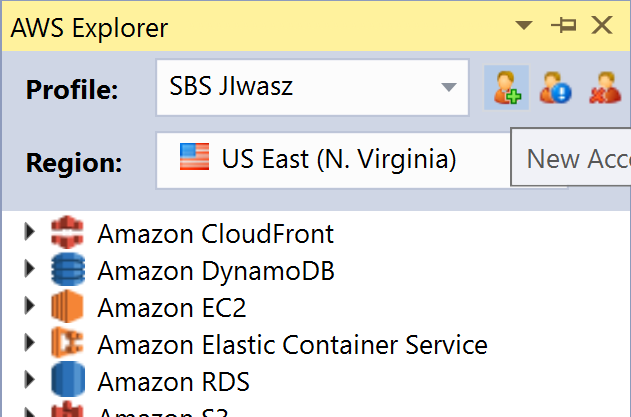 It supplies the name of the DynamoDB table to the dynamoContext instance. The SaveAsync method on line 45 will handle duplicate requests. If the message has already been written to the table, then it is updated. After executing this code, open the AWS console and navigate to the DynamoDB dashboard. 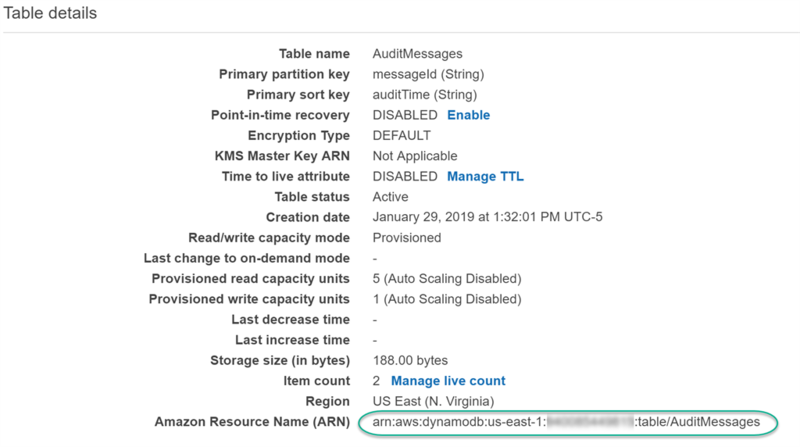 Select the AuditMessages table and copy the Amazon Resource Number (ARN) to Notepad. You'll need it later when configuring role permissions. If you're dealing with a relational table, you'll need to handle the exception and not rethrow it. If you're using node.js or Python to create Lambdas that process SQS messages, then you need to explicitly delete the message after handling it. Otherwise, the message remains in the queue. The opposite applies to .NET Core Lambdas. AWS automatically deletes SQS messages processed by .NET Core Lambdas unless the Lambda throws an exception. The example code above captures errors and then rethrows them in an AggregateException which puts all messages in the batch back into the queue, even if they were processed. Unfortunately, there is no elegant solution here. If one message fails, the batch fails. 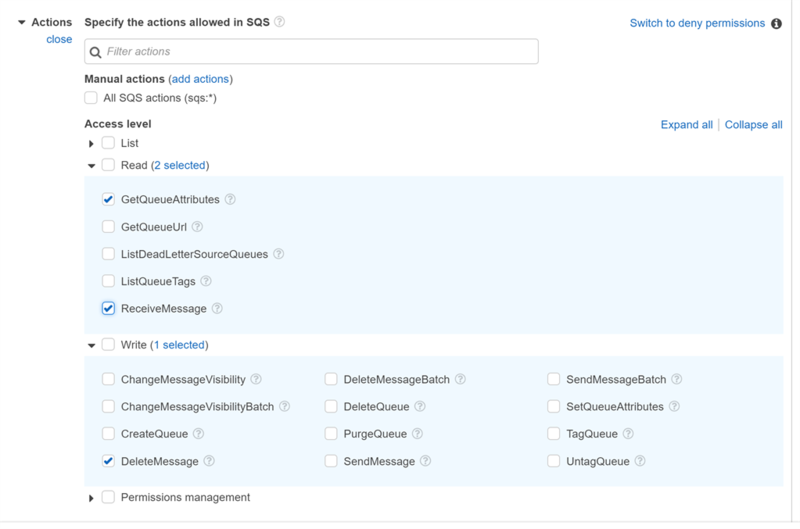 The auditmessagequeue is the destination of the audit messages and will be connected to the Lambda function. The ReceiveMessageWaitTimeSeconds attribute is set to the maximum limit of 20 seconds. By default, this is set to zero (0) seconds which causes SQS to use short polling. While this nearly eliminates the time any message spends in the queue, it unnecessarily burns through Lambda executions. The AWS free tier allows for one million executions before charging a nominal rate. When I first configured a queue, I left the default value and found I used most of my free executions within a week. As a best practice, set the ReceiveMessageWaitTime to more than 0. The Lambda will only be invoked when a message appears in the queue. At most, the message waits the number of seconds applied in the setting before being pushed to the Lambda function. Create the auditmessagequeue-deadletter queue. This is where the audit message lands if it cannot be processed in the auditmessagequeue as per the RedrivePolicy setting (line 22 and 28) on the auditmessagequeue. It will remain in the dead letter queue for ten days per the MessageRetentionPeriod setting on line 8. After executing this logic, navigate to the SQS dashboard in the AWS console. Locate the auditmessagequeue and copy the Amazon Resource Number to Notepad. You'll need this in the next section where you grant access to the Lambda function to read from the queue. At this point, the queue is deployed along with the DynamoDB table. Next comes the AuditReceiver Lambda function. Before we deploy it and wire it into the queue, the function needs an IAM role with rights to read from the queue. 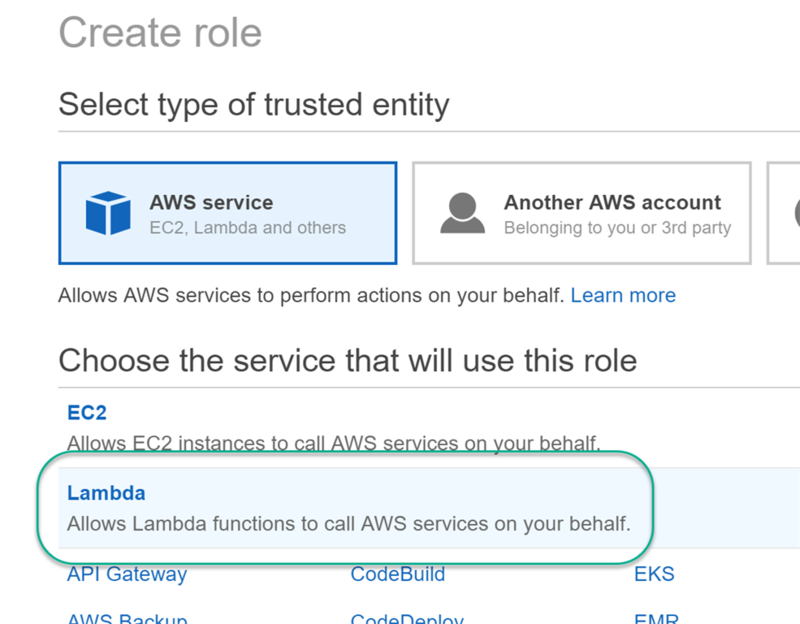 Browse to the IAM dashboard in the AWS console, select Roles, then select Create Role. On the first Create Role panel, select Lambda and click the Next: Permission button on the bottom of the screen. On the next screen, search for the AWSLambdaBasicExecutionRole. Select it and click the Next: Tags button at the bottom of the page. This will grant access to CloudWatch logs and other basic resources required for Lambda functionality. On the Tags screen, click the Next: Review button at the bottom of the screen. 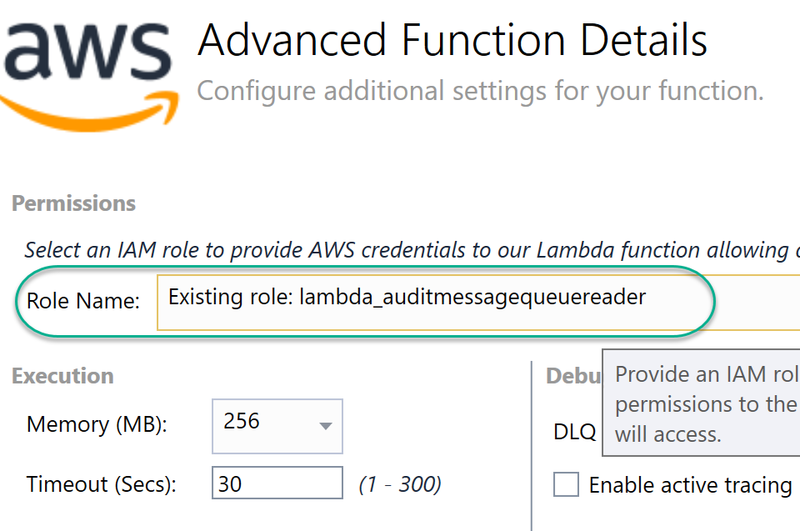 Enter lambda_auditmessagequeuereader for the role name and click Create Role at the bottom of the screen. While this configures basic rights for the Lambda, it does not yet grant access the to queue. To grant rights to read from the queue, navigate to the newly created role and grant the minimum rights needed to process queue messages. 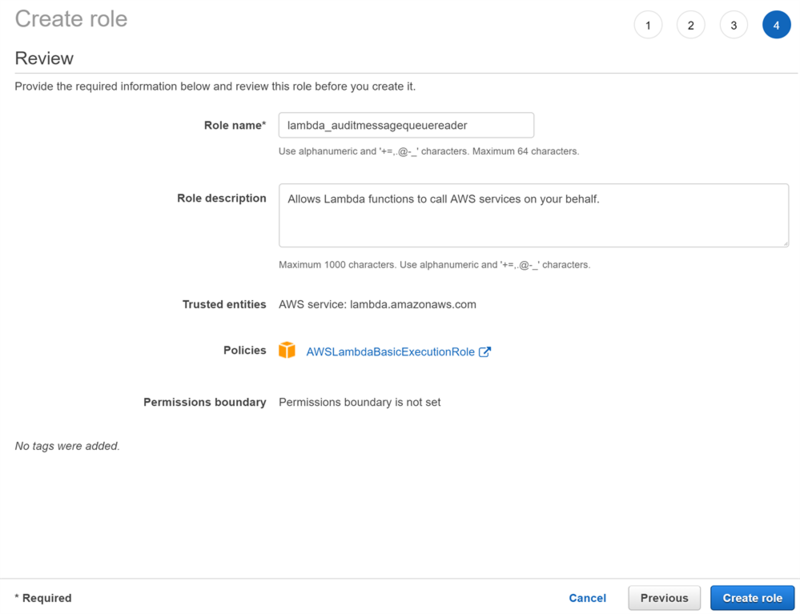 In the IAM dashboard, select Roles and locate the lambda_auditmessagequeuereader role. Click the role. Expand Actions and select GetQueueAttributes, ReceiveMessages, and DeleteMessages. Expand Resources and select Add ARN. Assign the ARN of the queue that was copied to Notepad from the prior steps taken when creating the queue and click Add. 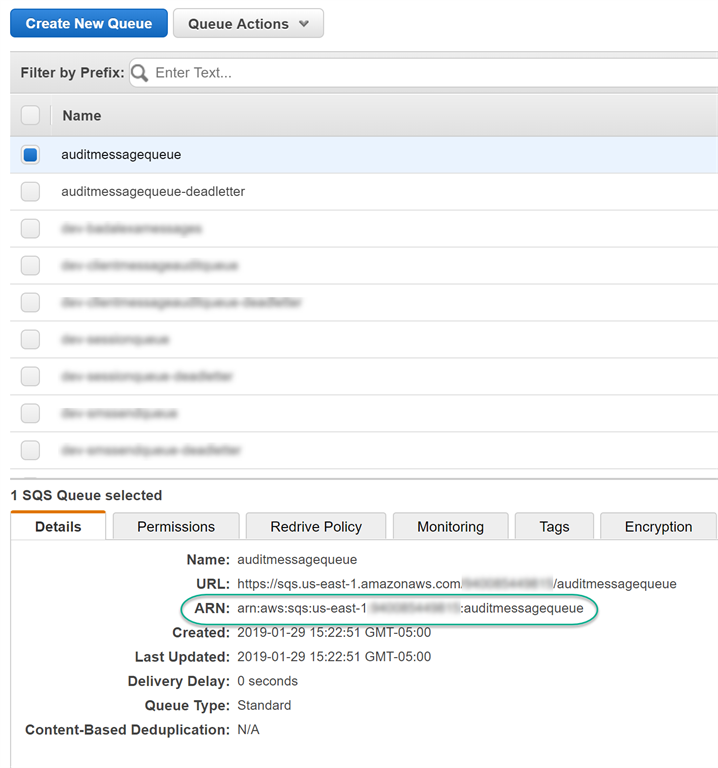 One the next page, enter AuditQueuePolicy as the policy name and click Create Policy. Open the lambda_auditmessagequeuereader role again. Expand Actions and select DescribeTable, PutItem, and UpdateItem. 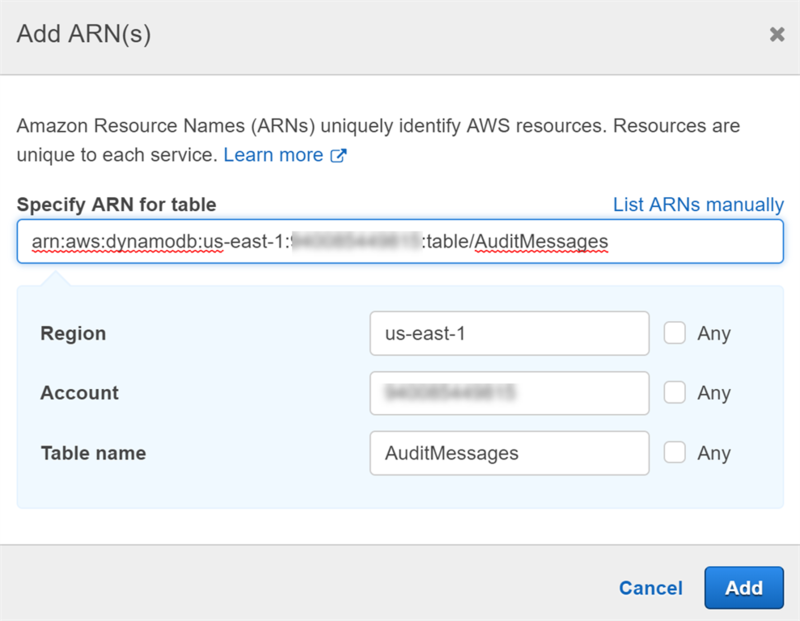 Apply the AuditMessages DynamoDB ARN that was copied in an earlier step after the DynamoDB table was created earlier and click Add. Enter AuditMessage_DynamoDBAccess for the policy name and click Create Policy. Now that the role is in place, we're ready to deploy the Lambda. Accept the default settings on the first page and click Next. On this page find lambda_auditmessagequeuereader role that was created in the prior steps. 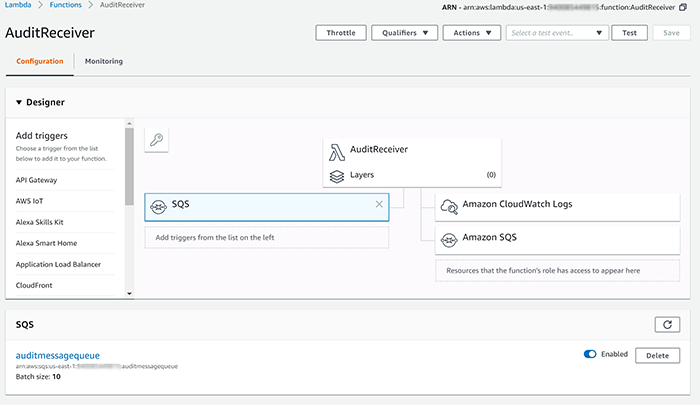 After executing this code, navigate to the AuditReceiver Lambda configuration in the AWS console. SQS show as a valid event trigger. The pieces are finally in place to send the audit message to the queue. Note that the queue URL is obtained first followed by a message to sent the message. In a production application, this could be addressed with a configuration value or a distributed cache that stores the queue. The steps outlined in this article touched on a number of AWS services including SQS, DynamoDB, IAM, and Lambda functions. These cloud-native services support a durable queuing and messaging architecture that can offload resource-intensive workloads to asynchronous processes using standard SQS queues and Lambda functions. In practice, DynamoDB inserts are just as performant as posts to SQS queues. If you are already inserting into DynamoDB in your user-facing application, this wouldn't improve your response time. 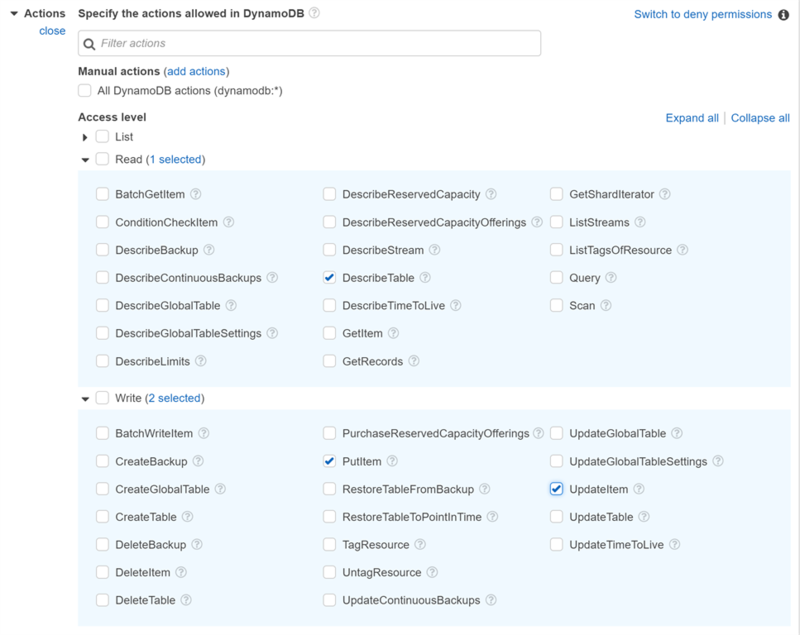 Rather than posting to a DynamoDB, you may use a queue to kick off a backend workflow process or post to an external service. In my experience, I've used this approach to send SMS requests via Twilio through a Lambda configured to receive push request from a standard SQS queue. All of the code samples are available in the Visual Studio solution attached to this article.